On December 13, 1989, at the ASA’s Fifth Annual Hall of Fame Awards Dinner, Harry Carpenter became the second sportscaster inducted into the ASA’s International Hall of Fame. The following appeared in Dinner Journal which was given out at the event. BBC’s full-time boxing correspondent since 1962, Harry Carpenter began sports reporting as a sub-editor for several national newspapers, serving as a boxing columnist for the Sporting record from 1950-1954. He then joined the Daily Mail as a boxing writer and sports columnist from 1954-1962. While his name is most often associated with boxing, Carpenter has established himself as one of England’s most versatile sportscasters, covering many of the major sporting events. He has been a regular member of the broadcast team on “Sportsnight” and “Grandstand,” and covered all major golf tournaments since 1965. He has served as the commentator on the University Boat Race, and greyhound racing. 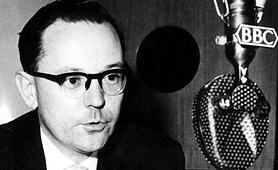 In 1967, Carpenter began covering Wimbledon for BBC. “The American Sportscasters Association is pleased to induct Harry Carpenter into the International Hall of Fame in recognition of his outstanding achievements in the field of sports broadcasting.